Have you ever try before the Nonya Kaya? I did! 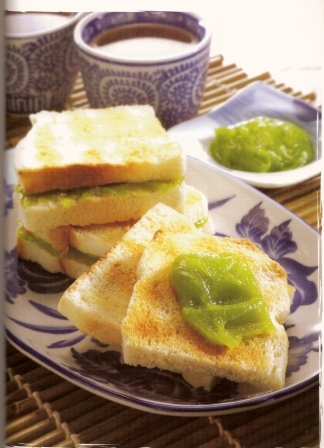 Every morning since young, I start off my day with the Nonya Kaya, a green sweet hue which is spread across my toasted bread leaving a fragrance pandan scent in my mouth at the same time making me wanting for more. The making of everyone-loves Nonya Kaya consists of two steps. First the mixture of eggs and sugar is beaten with coconut milk or cream together with pandan leaves infused. The mixture is then stirred slowly over a double boiler to start the coagulation of eggs. Next the mixture is poured into a clean container, tightly covered and then steamed over a low heat from one to five hours depending the recipe. At the end of the production, you will get the green smooth, shiny and thick kaya. A portion of coconut milk and two portions of eggs as well as two portions of sugar are recommended with pandan to your choice to produce the soft and firm kaya. You can also lower the amount of sugar level if you or your family and friends prefer to have a kaya that is not too sweet. The making of the Nonya Kaya is easy as the ingredients can be bought at the nearby market. Everybody can give it a try at home when you are free, because I am making one for my family and friends too!